Geneva Smith Douglas is recognized in Nevada for her extraordinary work at the Nevada Test Site and her development of an offsite radiation monitoring program. Douglas was also extremely active in civic service organizations. Douglas was born in Gloucester, Massachusetts in 1932. 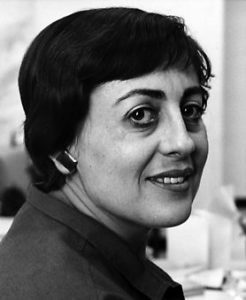 She worked as a research associate at the University of Rochester Atomic Energy Project after graduating from Mount Holyoke in 1956. Douglas moved to Las Vegas in 1959 when she joined the U.S. Public Health Service as a radiation biologist for the Southwestern Radiological Health Laboratory. Douglas, working for both the U.S. Public Health Service and the Environmental Protection Agency (EPA), built relationships with communities close to where nuclear testing was carried out. Later she developed an offsite radiation monitoring program while working as the Program Operations Manager of the Environmental Monitoring Systems Laboratory. In 1985, Douglas retired from the EPA. However, she continued be a nuclear technical advisor, working out in the field, offering her expertise to simulated and actual nuclear disasters, and speaking to Congress. Douglas extended her public relations expertise to the community service field, serving twice as president of Soroptomist International of Greater Las Vegas. She also participated in the Sierra Nevada Region and the Friends of Nevada Wilderness, again using her skills to help lobby Congress on issues such as environmental preservation. Douglas chaired the Governor’s Advisory Committee on Volunteerism under Nevada Governor Richard Bryan in 1986. In this position, Douglas helped promote volunteer activity in the state. In addition to organizing several workshops on volunteer resources and training, Douglas also organized the first statewide Conference on Volunteerism. For further biographical information: Geneva Douglas papers. Nevada Women’s Archives. Special Collections, UNLV. Collection number 93-35.